A few weeks ago, as I stood at the counter flouring, egg dipping, and breading two pounds of eggplant rounds, a little dolly screaming at my feet wanting nothing more than to be held at the height of this witching hour, I found myself asking “WHY? !” I know better than to make this sort of thing at this sort of hour. I shouldn’t be so stubborn. 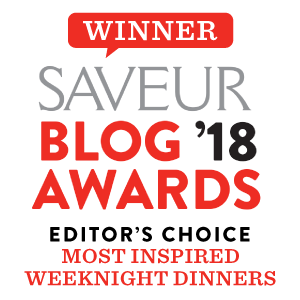 But a craving for eggplant parmesan left me inflexible, and I pushed on until crumbs and parmesan covered every slice, trying to stay composed through every piercing cry. Oiy. But as soon as those rounds entered the oven, I relaxed. And this is the beauty of The America’s Test Kitchen Family Cookbook eggplant parmesan recipe. Once the breading is done, the hard work is over — there is no standing at the oven, frying the eggplant in batch after batch. 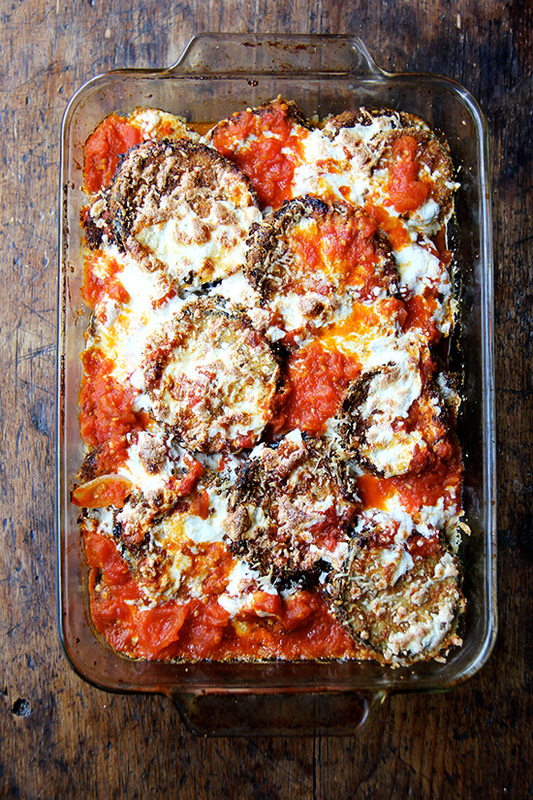 The Test Kitchen’s recipe calls for baking the eggplant on preheated baking sheets, a technique they developed to solve the oil-laden, pan-fried eggplant problem that leads to heavy, greasy eggplant parmesan. Oven-frying saves time to boot. 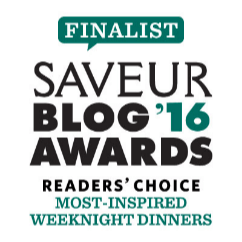 If you’ve made eggplant parmesan, you know, however, that no matter what time-saving tricks you’ve devised, it is still a labor of love. The eggplant should be salted and drained for about 40 minutes, which makes the slices less prone to soaking up gobs of oil. 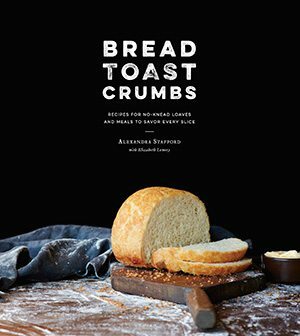 Breading takes time, too, and if you make your own sauce and breadcrumbs, you’re going to be spending some time in the kitchen. But this time of year, there is nothing more comforting than a cheese-and-sauce bubbling casserole, and the Test Kitchen’s recipe is so good. I’ve shared the full recipe over on Food52, and I’ve included a little variation here in case exhaustion gets the best of you, and upon seeing those crispy eggplant rounds emerge from the oven, you throw in the towel and call dinner done — I’ve stopped here on more than one occasion. 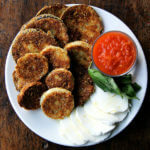 These crispy rounds are irresistible, and with a few slices of cheese, some bread, sauce, maybe some prosciutto or other cured meats, you can make a meal out of them. Little ones, teary eyed or otherwise, seem to like them, too. 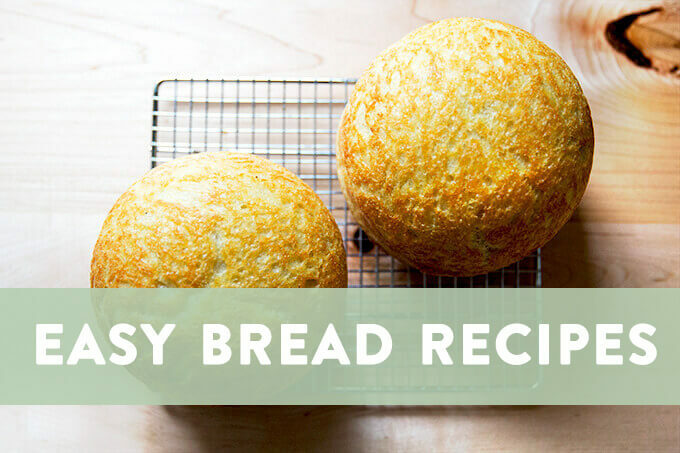 This is a long-time favorite recipe from The America’s Test Kitchen Family Cookbook. What I love about this recipe is that there is no standing over the stove frying the eggplant in seemingly never-ending batches. 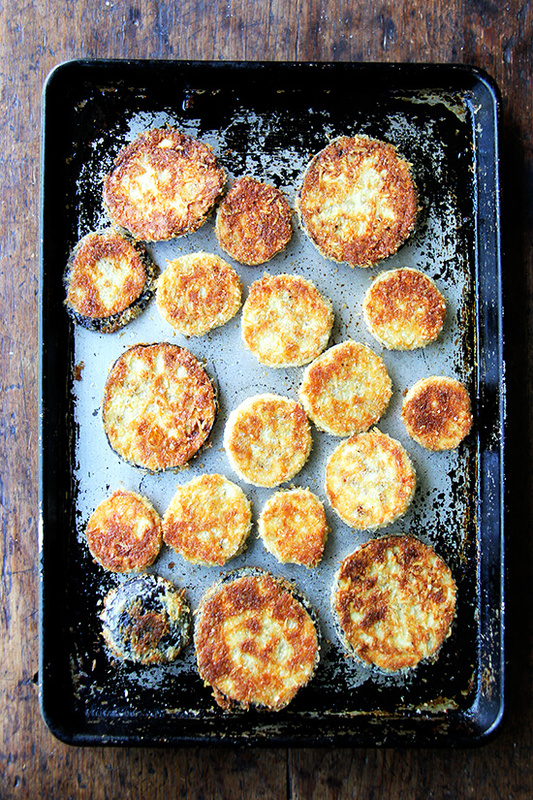 This step is eliminated by baking the breaded eggplant slices on preheated baking sheets. 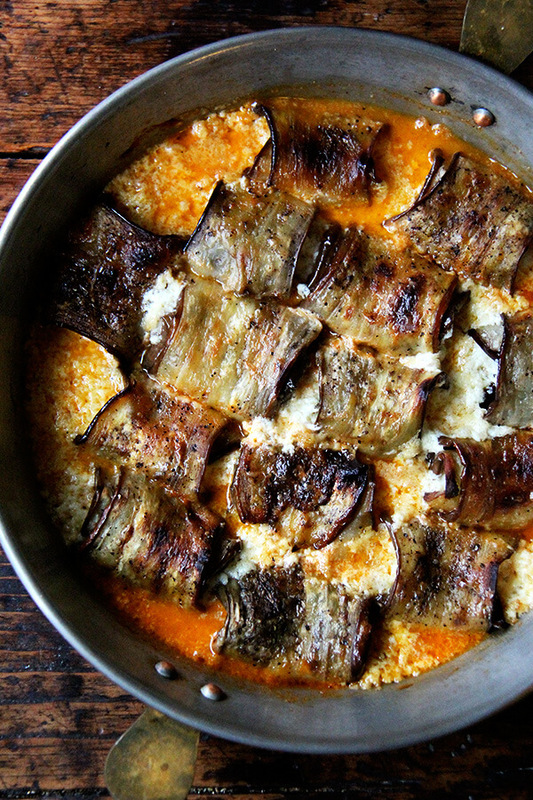 The eggplant emerge from this step crispy and golden and are irresistible. 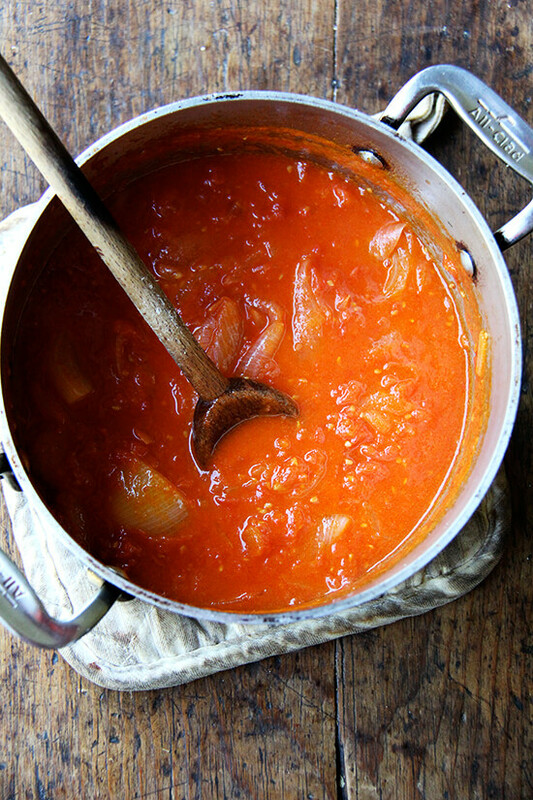 I love serving them with homemade tomato sauce (this one or this one), fresh mozzarella, and basil. 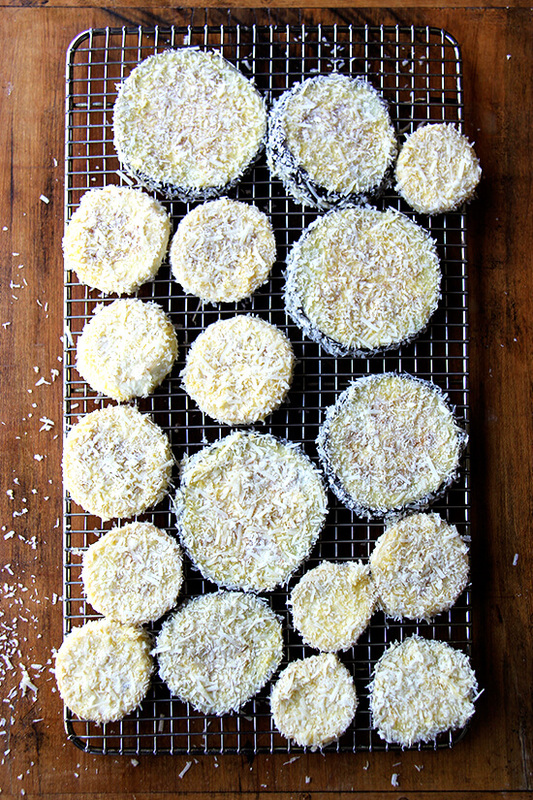 If you want to turn this into eggplant parmesan, find the recipe on Food52. Working with about 8 eggplant slices at a time, place them in the bag with the flour, seal, and shake until thoroughly coated. 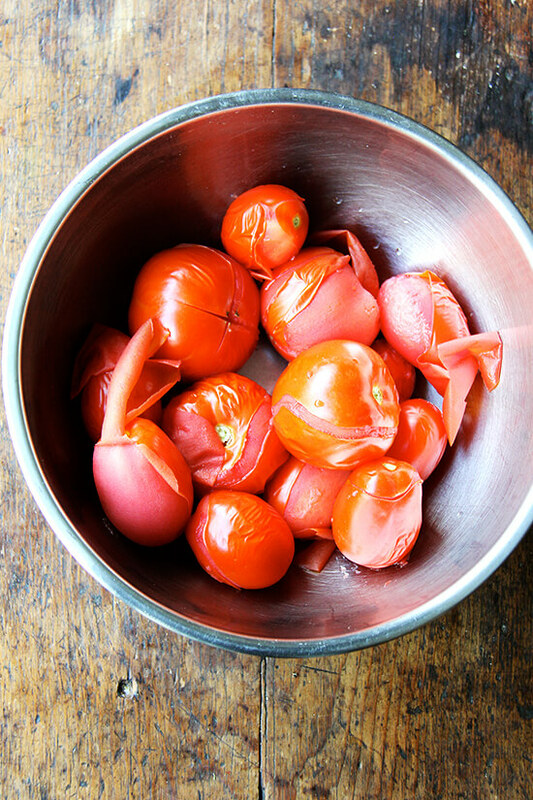 Remove the eggplant, shaking off any excess flour, and dip it into the eggs. Remove the eggplant from the eggs, allowing any excess egg to drip off, and coat evenly with the breadcrumbs, pressing them to adhere. 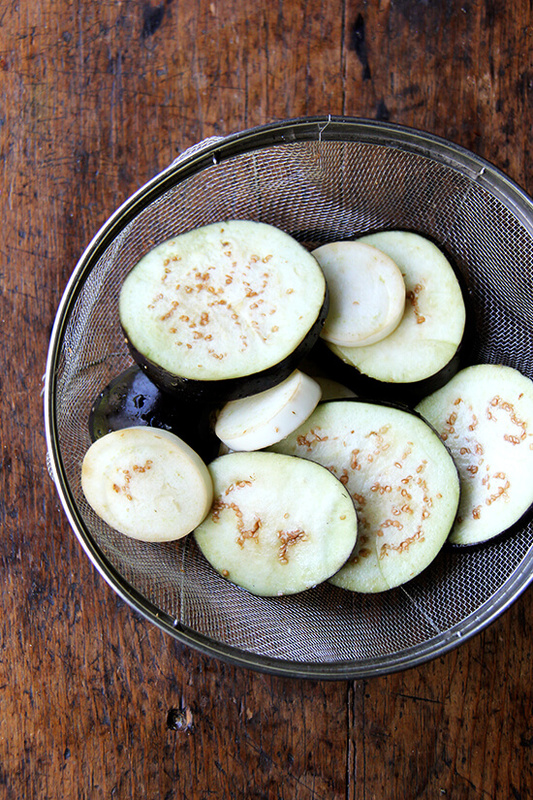 Lay the breaded eggplant on a wire rack. 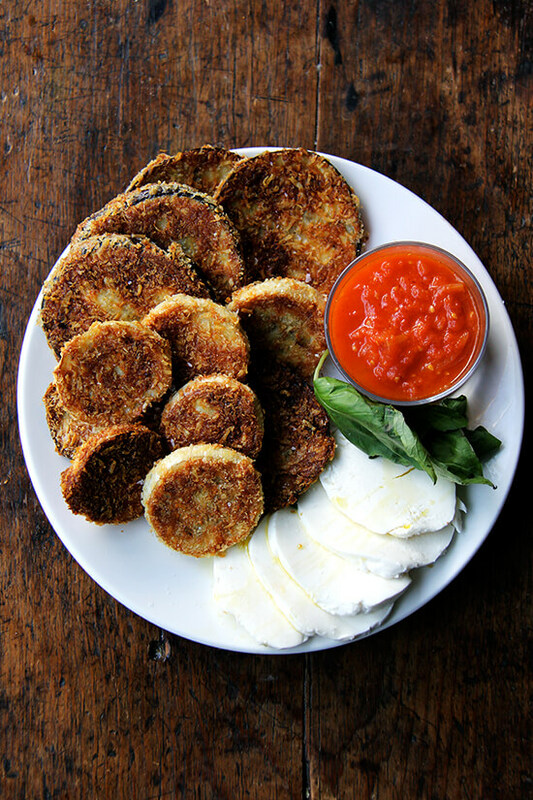 Flour, dip in egg, and coat the remaining eggplant in breadcrumbs in the same manner. 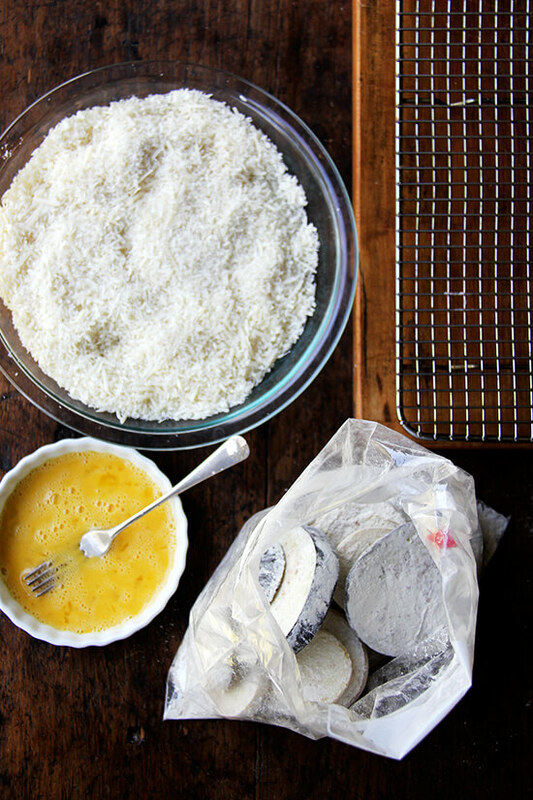 Remove the preheated baking sheets from the oven. Pour 3 tablespoons oil onto each sheet, tilting to coat the sheets evenly. 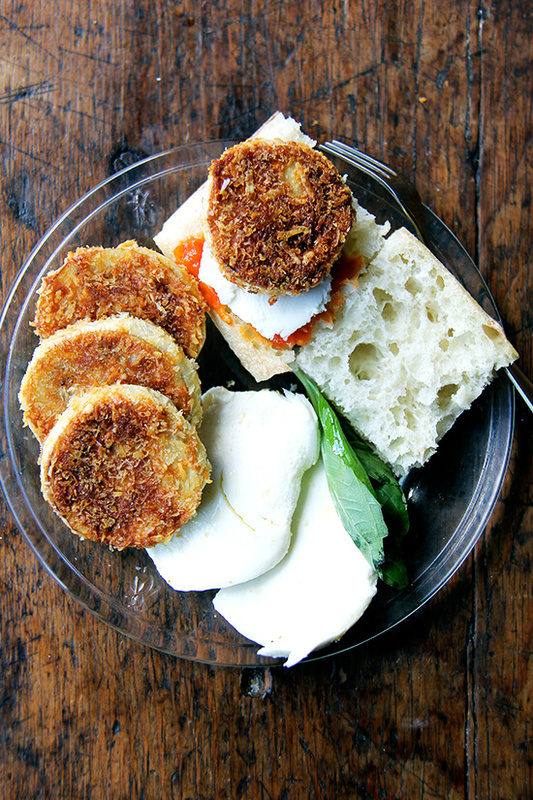 Spread the breaded eggplant in a single layer over the hot sheets. Bake until the eggplant is well browned and crisp on the first side, about 15 to 20 minutes. Flip the eggplant slices over. Switch and rotate the baking sheets, and bake until the second side is brown, about another 10 minutes. Serve with tomato sauce, mozzarella, and basil. 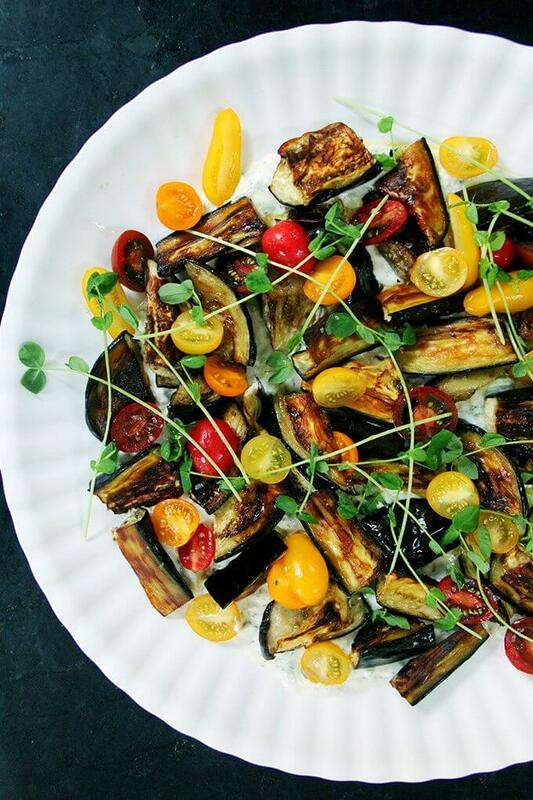 I love eggplant and this looks like a perfect fall meal. Thanks for sharing! Beautiful photos too! I have a few sad eggplants in my fridge. Will give these rounds a go this weekend. Thanks! This is a childhood recipe for me. Makes me think of my Mom. Yours turned out definitely nicely brown and crispy. Totally delicious. 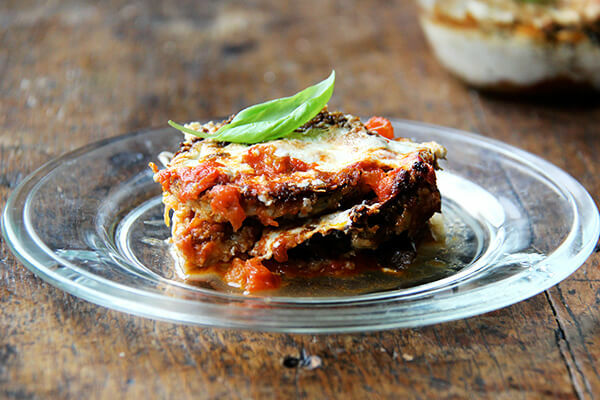 sad about eggplant season ending soon here…I will give them one last hurrah with this recipe! 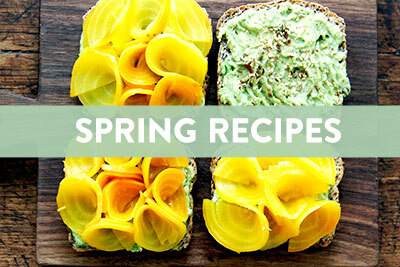 That sheet pan with all the differently-sized slices…. it’s just so pretty! You did good Ali! 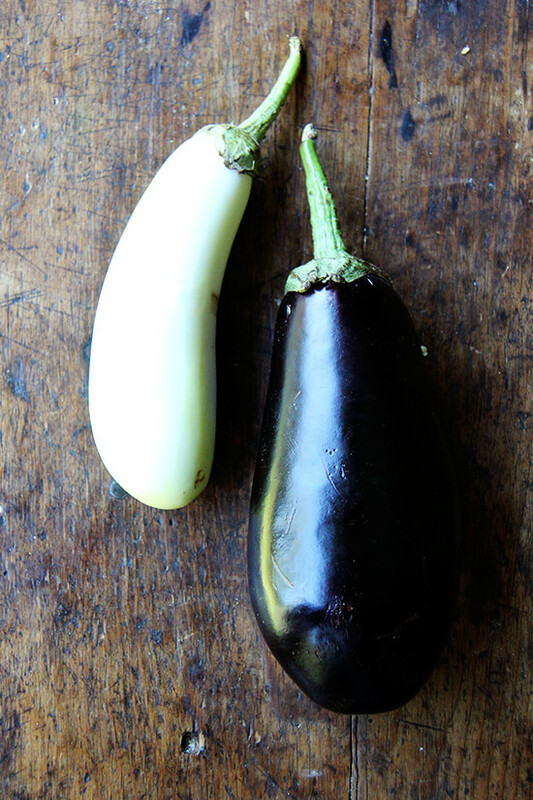 Gosh, you and your writing were instrumental in eggplant becoming a True Love in my life. I have never seen a white one! I would love to try it! I am obsessed with putting eggplant on pizza right now, almost mashing it, like a sauce. But suddenly I only have eyes for those eggplant parmesan SANDWICHES! Yum! I love eggplant on pizza, too — it gets so soft and creamy. And yes re sandwiches…yum! I like tthe valuable iinfo you provide in your articles. I will bookmaek your blog and check again here frequently. 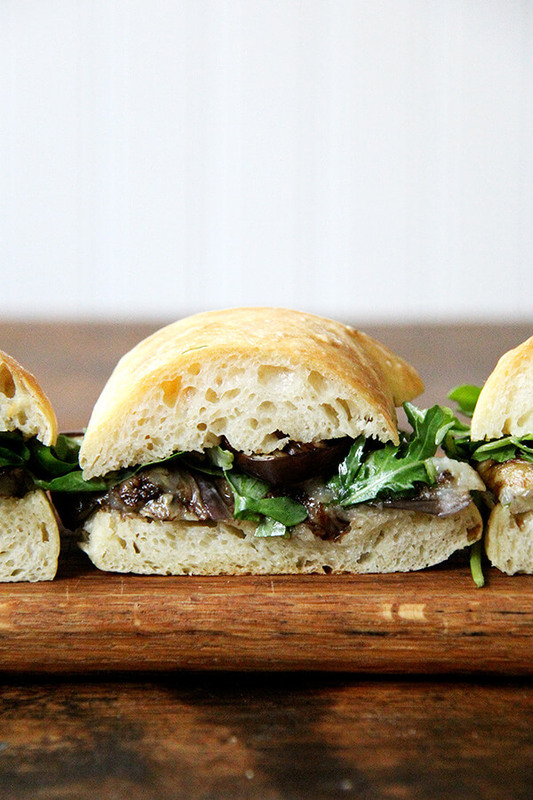 Holy cow are these eggplant rounds delicious! I have two enormous racks of them cooling off in my kitchen right now and I really hope that there are some left for dinner tonight. These might just be my new obsession. Thanks for the great recipe! Yay! I’m so happy to hear this. Aren’t they addictive? getting more from this web page, and yoir views are good in support of new people. Ali!!! In my past cooking endeavors, I’ve managed to mess up jello, mac and cheese and muffins from a box…. but I tried this and it is delicious!!! (Okay, sauce was from a jar and I was short a few ingredients…. but, it WAS successful!!!) THANKS!